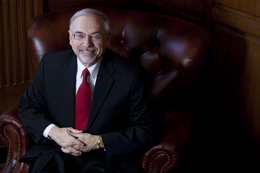 Prayer Request: Dr. Ron Manahan (my immediate predecessor as president of Grace College and Seminary) had a heart attack during the early morning hours of Monday. He is in Lutheran Hospital in Ft Wayne where he is scheduled for by -pass surgery (3-4 arteries) around 7:00 am tomorrow morning. Ron, Barbara, and their entire family are all very appreciative of our prayers and want the Grace Community to know that they trust the Lord for His will and outcome. We will keep you updated once we know the outcome of the surgery. Thanks for praying for Ron and his family. I pray for God's best for you. I miss the days we used to talk. I remember those days you were working on your dissertation on the cultural mandate in Genesis 1. Maybe you remember me, maybe you don't. I forgive you nevertheless. Eisenbraun too.